Carey, J 2008, ‘Whose story is it, anyway? Ethics and interpretive authority in biographical creative nonfiction’, Text, vol 12 no 2. Carey, J, Webb, J & Brien, DL 2008, ‘A plethora of policies: Examining creative research higher degrees in Australia’, in L.Neave & D.Brien (eds), The Creativity and Uncertainty Papers: the Refereed Proceedings of the 13th Conference of the Australian Association of Writing Programs, UTS, Sydney, 2 September 2008. Carey, J 2008, ‘Gatekeepers, Process Consent and Real Names: Ethical aspects of writing vivid stories based on qualitative research in palliative care’, in T.Hays & R.Hussain (eds), Proceedings of the 2nd Annual Postgraduate Research Conference – Bridging the Gap between Ideas and doing Research, Faculty of the Professions, University of New England, Armidale, pp. 18-26. Palliative care research is often described as difficult and challenging. This is largely due to ethical issues that arise in dealing with vulnerable patients and families, who are likely to be emotionally and physically burdened by their situation. Gatekeepers who control access to palliative care clients have a reputation for being reluctant to let them be further troubled by requests to take part in research activities. This means that getting a research proposal approved by an ethics committee, or convincing nurses to distribute invitations to participate, may require persuasive arguments as well as careful construction of an ethically defensible research protocol.My proposed palliative care research will be based on solicited reflective diaries and semi-structured interviews with home-based family carers, and forms part of study toward a PhD in the area of creative nonfiction writing. This paper discusses the ethical issues that were considered in preparing an application for the Human Research Ethics Committees of Hunter New England Health and the University of New England. The discussion of strategies for approaching gatekeepers, ensuring beneficence, and negotiating consent will offer insights for the conduct of any research involving a vulnerable population and a sensitive topic. A dual consent process and giving participants the choice of real names rather than pseudonyms in publications are interesting and distinctive features of my research project. Carey, J 2008, ‘Role misconceptions and negotiations in small business owner / web developer relationships’, Journal of Management & Organization, vol. 14, no. 1, pp. 85-99. Small business owners who turn to professional web development consultants for assistance with building a web site may need support not only in terms of the technical aspects of web site implementation, but also in terms of understanding their options for e-business. However, client/consultant relationships within the small business sector can be problematic and the limited research available into small business engagement of web developers suggests that bad experiences and disappointing outcomes are not uncommon. Interpretive case study methodology was used to explore four sets of small business owner / web developer relationships: how each pair worked together and what they expected of each other. The negotiation and clarification of roles and responsibilities proved to be an essential aspect of the relationships. Also, achieving an adequate level of client involvement in the web site design and development process was a challenge in all cases. 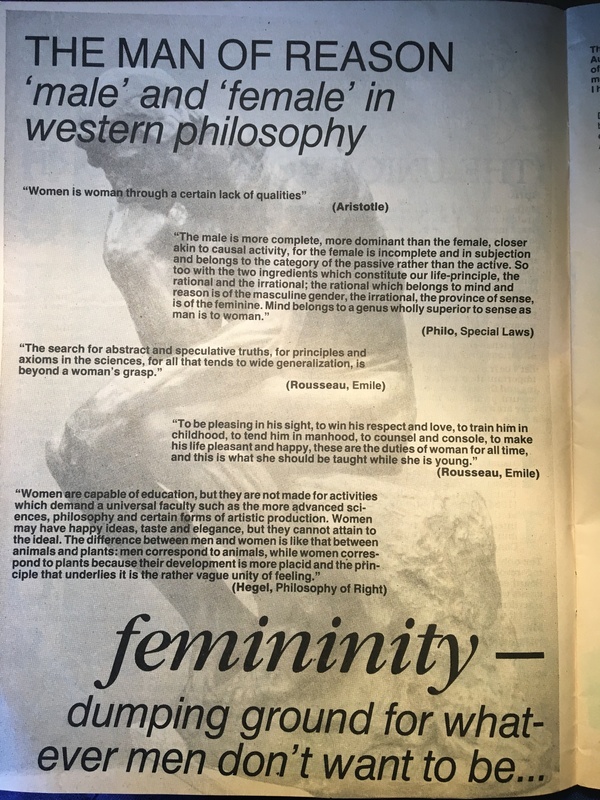 BOOK REVIEW: The Man of Reason: ‘Male’ and ‘Female’ in Western Philosophy by Genevieve Lloyd. 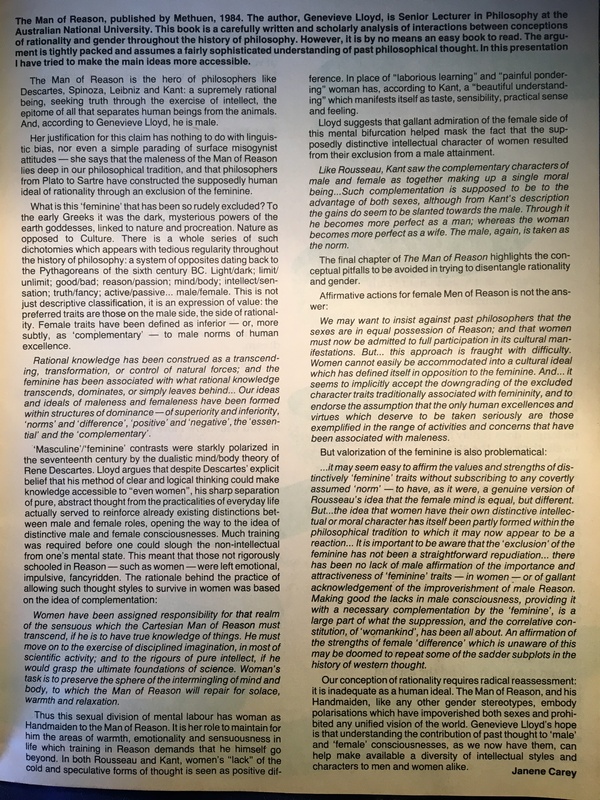 ‘The Man of Reason’, Passing Show , Macquarie University Union publication, vol.13, no.3, May 1985.